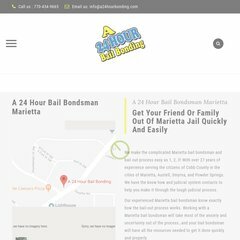 Topics: Kennesaw Bail Bonds, Austell Bail Bonds, Powder Springs Bail Bonds, Marietta Bail Bonds, Smyrna Bail Bonds, and Free Info. The site has about 14 users daily, viewing on average 1.60 pages each. It is hosted by Hostasaurus Inc (Florida, Tampa,) using Apache web server. It has 4 nameservers, including ns2.hostasaurus.com, ns3.hostasaurus.com, and ns4.hostasaurus.com. Its local IP address is 208.77.53.41. PING www. (208.77.53.41) 56(84) bytes of data. A ping speed test response, is timed at 54.7 ms.